Controlling the cellular interaction and internalization of polymer-modified nanoparticles (NPs) is of central importance to the development of promising nanomedicines. Here, we describe the use of synthetic polypeptides for NP surface coating and regulation of their cellular uptake behaviors by simply switching the conformation and anchoring orientation. Our results show that gold NPs (AuNPs) coated with a helical poly(γ-(2-(2-(2-methoxyethoxy)ethoxy)ethoxy)esteryl L-glutamate) (L-P(EG3Glu)50) from the C-terminus ((L-C)-AuNPs) exhibit greater zeta potential and more cellular uptake (2.0–5.5 fold higher) than those coated with the same polypeptide but anchored from the N-terminus ((L-N)-AuNPs), or from both the C- and N-terminus at a 1/1 molar ratio ((L-C/L-N)-AuNPs). A similar orientation-regulated cellular internalization pattern is observed in D-P(EG3Glu)50 but not the unstructured DL-P(EG3Glu)50-modified AuNPs, suggesting an important and universal role of the helix-derived macrodipole in cellular uptake. Moreover, this orientation-governed internalization is successfully reproduced in P(EG3Glu)50-coated gold nanorods (AuNRs), and applied to the design of doxorubicin-loaded polypeptide micelles. Simulation study offers time-resolved insights regarding the NP–membrane interactions and membrane remodeling. Thus, our study provides a delicate way of regulating the surface chemistry of NPs and the subsequent NP–cell interactions. Moreover, the results highlight the uniqueness of polypeptides in NP surface engineering, and urge a more careful consideration on the polymer orientation effect. Chong Zhang, Jianhua Lu, and Falin Tian contributed equally to this work. 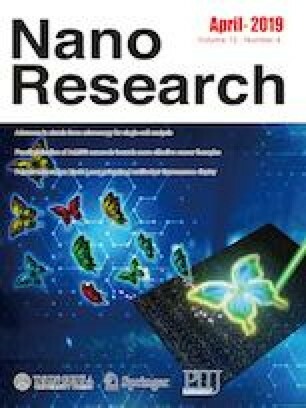 Supplementary material (materials and instrumentation; SEC and 1H NMR spectra of synthesized polymers; TEM images, TGA curves, viability assay and DLS characterization of polypeptide-coated AuNPs and AuNRs; cytotoxicity assay of polymer micelles and details for simulation method and model) is available in the online version of this article at https://doi.org/10.1007/s12274-019-2319-6. Financial supports from the National Key Research and Development Program of China (No. 2016YFA0201400) and the National Natural Science Foundation of China (No. 21722401) are gratefully acknowledged.